When doing a gauge swatch, should it be in pattern? 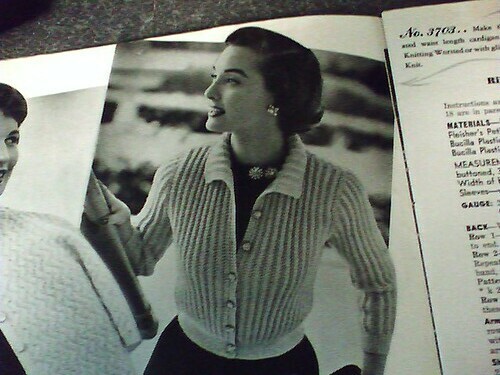 I want to start on a ribbed sweater (the book is 1954), but I'm having a very hard time with gauge. I get my mail here. Yes, it should definately be in pattern! The exception is when it says, under the gauge, "in stockinette", which means the designer checked for gauge in stockinette. Ribbing gauge is measured differently, btw. Are you measuring it stretched or unstretched? Check the gauge both ways. That's my problem. Unstretched, it's way too small. Stretched, it's way too big. As a general rule, I usually need to go up one needle size to get the right gauge. Exactly what is the yarn description? Oh, and what book is it? I might even have a copy. It's Fleisher's "Cardigans, Cardigans, Cardigans". I see it quite regularly on eBay. The cover shows a mother/daughter pair in matching plaid skirts and red cardigans. The pattern calls for Fleisher's glow-knit or Fleisher's petite knitting worsted and size 3 needles for ribbing and size 6 needles for the pattern. The yarn I have is Cascade Sierra. I think Sierra is a bit heavy for that garment. Also, a yarn made with that much cotton will not act like wool, which has good memory. I think that's another reason your gauge is off. I found a pic online of something made from Glow-Knit and it looks closer to baby or sock yarn in gauge. I don't have that particular book; do you know if there's a photo of it somewhere on line? Here's a pic of the sweater. It doesn't look that fine to me, but I am a newbie. Here's another question: is it an American publication? If not the needle sizes (whether UK or Canadian) will be different. And I don't think Fleisher did this, but Minerva used to have their own needle sizes, believe it or not! Also: sometimes in the back of the book you can find a listing of the fiber content of the various yarns, that will help, too. And...is that actually plain ribbing or an openwork design? It's looks like an openwork ribbing to me, and it's tough to get gauge on something like that until your swatch is blocked. Lace opens up considerably. Have you washed and blocked it? Your answer might be that simple (again, bearing in mind that cotton has no memory). Also, are you using two needle sizes, one for the waist ribbing & cuffs & the other for the body? If so, make sure you're using the correct one to determine your gauge. No, there's no openwork. The body of the sweater is done in K2, P2. How interesting! It really doesn't look that way in the photo. Can't believe everything you see, I guess. First of all, as Lindy said, I would definitely very carefully and precisely wash/block your swatch prior to checking the gauge -- most vintage books skim over/don't mention that sort of thing, as in those days, most people were fairly advanced knitters, having started as young children, so the books sort of assumed you already know that sort of thing. I've also had bad luck attempting to sub contemporary yarns for vintage ones -- due to current fibres/manufacturing processes/fads, I've found that nothing turns out QUITE right. even at the enormous world-renowned WEBB's, I've never had much luck finding anything really, truly appropriate to sub, especially for the more specialized yarns -- also, it seems that most yarns these days are far more chunky that vintage ones. and like Lindy said, a lot of modern yarns don't hold their shape as well as old-fashioned ones, so also they may appear to be the right gauge, they just won't drape the the same way, resulting in a different look, or even overall size. Lindy, isn't it wild about the Minerva needles? (It seems from my books that American needle sizes weren't truly standardized until approximately the early '50s, or at least at some post-War point...it took me awhile to figure out, but it appears that the "Minerva MM" sizes are actually like the current European metric sizes. strange. They're close, at least, which helps in finding all the odd half-sizes.) Also, in those days, dps ran the opposite direction than they do now -- the larger the number, the smaller the size -- like British sizing. I have a handy-dandy early '30s doohicky from Boye which indicates/measures all of the vintage-sized needles (both regular and dps), the corresponding crochet hooks (which also used to be sized differently), and what sorts of yarn are appropriate for each size needle. It's a godsend! Gauge is king, that's all! Actually, it was the steel needles that ran the opposite to current sizing; it took me a while to pick up on all those weird variations. I have found wonderful yarns at WEBS for subbing. Cone yarns are the way to go. The 1921 pattern I'm working on right now is knitting exactly to gauge with the cone yarn I'm using. now, I'm quite discouraged. Is there any place to find vintage yarn besides ebay? I'm having no luck finding yarn on ebay. I also have a Bernat pattern that I'd like to do, but can't find anything. Use baby yarn for fine gauge. It works very well. Just change needle sizes and keep trying. I've never had a lot of trouble in subbing. And the more you do it, the easier the process becomes.